Consisting of long stretches of Italian countryside and some heavy braking turns, the Formula 1 cars' annual arrival at the 5.793-kilometer (3.6-mile) Autodromo Nazionale Monza sees reigning World Champion Sebastian Vettel back to winning form are a convincing victory at the Belgium Grand Prix. Set for 53 laps around the storied Monza circuit, the Italian Grand Prix's race grid presented the Red Bull-Renault of Vettel in the preferential pole position. On virtue of a qualifying best time just under half a second faster than the closest competition, German Red Bull Racing driver was initially placed for what could be a second Monza victory following his first Formula 1 win in 2008 with Toro Rosso. Catching many Formula 1 observers by surprise that day three years ago, Vettel is now favourite to win the Italian Grand Prix in 2011. As the lights went out allowing the 24-car field to thrill the Italian crowd with the world's top open wheel racers, drama built up immediately as leaders lurches forward from their start. By the first turn of the 2011 Italian Grand Prix, it was not Sebastian Vettel's Red Bull-Renault leading the Formula 1 drivers. Sailing from the start, Fernando Alonso combined the application of his KERS system and daring move on the inside of Vettel down the front stretch into the first turn (Monza's Variante del Rettifilo turn) to position his Ferrari in the lead. Naturally, the sight of the Ferrari Formula 1 car leading the infant 2011 grand prix immediately attracted a thunderous roar from the Italian fans. As Alonso secured the lead into the first corner, havoc occurred seconds after several leaders weaved out of Variante del Rettifilo. Buried in the back of the Italian Grand Prix starting grid, HRT driver Vitantonio Liuzzi pushed hard to pass as many vehicles as possible before the first corner. Working through a three-wide scenario, Liuzzi's car was lured onto the Monza circuit's grass. With near zero traction as the Pirelli racing slicks skated over the grass surface, the HRT-Cosworth cut through part of the first turn crashing into the Lotus Renault car of Vitaly Petrov. Mercedes GP driver Nico Rosberg was also collected in the accident with race-ending damage to his racing machine. Other drivers receiving minor damage in the melee were saved from losing valuable track position with Formula 1 calling out the safety car before the 2011 Italian Grand Prix was barely 1 lap old. While Ferrari's Fernando Alonso ignited the Italian spectators with his lap 1 heroics, the celebration of the famous red car at the front would not last. As the safety car returned to pit lane, Sebastian Vettel was engaged in full attack mode on the Alonso's Ferrari. Aggressively searching for an opening to reclaim the race's lead, Vettel found a line through the Curva Grande portion of the Monza track dramatically kicking up some dirt as he drifted his Red Bull-Renault to make contact with the race surface's edge. As Vettel slowly built up a much needed lead, his Red Bull Racing teammate Mark Webber would experience an early retirement from the Italian Grand Prix in 2011. Colliding with Ferrari's Felipe Massa on the restart of racing, Webber lost the front wing of his race car. In an attempt to soldier back to the pits, Webber lost control of his Red Bull-Renault just first corner prior to reaching pit road. Costly for the Formula 1 World Driver's Championship points, Webber retired for the first time this season from a grand prix. Behind Vettel, 2nd through 5th in the Italian Grand Prix became an exciting battle of past world champions jockeying for position. Seven-time Formula 1 driver's champion Michael Schumacher held fiercely onto a third place spot the German driving master acquired on the initial start of the grand prix piloting the Mercedes GP. Holding tightly onto the final podium spot, Schumacher's Mercedes factory car would be challenged individually by the McLaren team drivers powered by customer Mercedes-Benz engines. As Jenson Button became the first McLaren pilot to pass Schumacher, the Mercedes GP driver initially blocked the Brit and would receive a friendly warning from team principal Ross Brawn. Lewis Hamilton would get around Michael Schumacher on the 27th lap. Despite falling prey to the McLaren-Mercedes cars, Schumacher maintained a solid effort by bringing the Mercedes GP car 5th across the line at the end of the Italian Grand Prix at Monza. As the race progressed, maintaining pace with Sebastian Vettel was the best any driver could achieve during this 2011 Italian Grand Prix. Despite passing Alonso on lap 36, Jenson Button did not have the momentum to catch the flying Red Bull-Renault. Crossing the line with a 9.5 second lead, Vettel brought Red Bull Racing to their first victory on the Monza track. 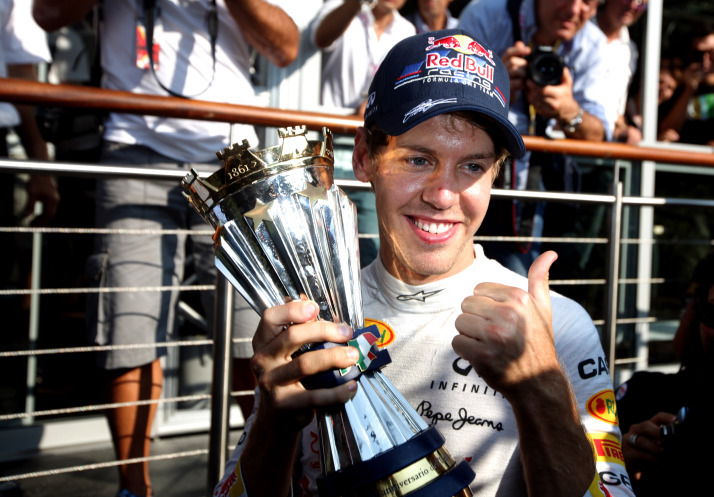 In post race, Sebastian Vettel recalled, “It was an emotional win today. This circuit means such a lot to me and is very special. I had my first win here, so when I crossed the line I remembered every single bit of it. The podium is absolutely unbelievable here; when you stand up there you feel blessed, as it doesn’t happen to many people." 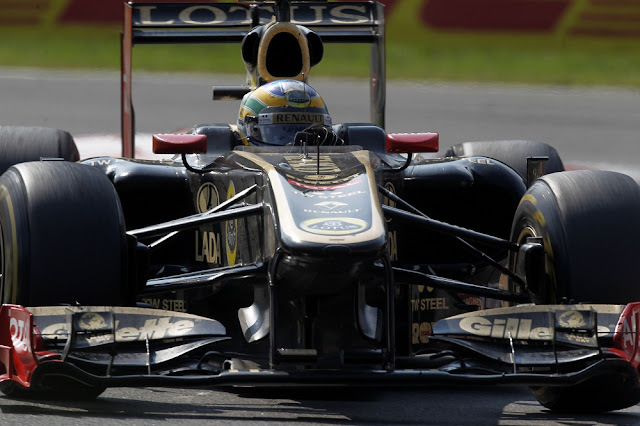 The win becomes the German's 18th in Formula 1 and pushes him to an astonishing 112-point advantage in the 2011 championship. As JensonMcLaren, Fernando Alonso's Ferrari was 7.4 seconds behind taking the final podium position for the race team's home event. Both Button and Alonso lost ground to Vettel but gained much needed points on Mark Webber. Lewis Hamilton, Michael Schumacher and Felipe Massa rounded out the top-6 of the 2011 Italian Grand Prix. Deeper through the race results, the top-10 of the race featured Scuderia Toro Rosso cars of Jaime Alguersuari and Sebastien Buemi grabbing point-paying finishes. Force India's Paul di Resta finished 8th in the Italian Grand Prix while Lotus Renault GP's Bruno Senna scores 9th place for his first career Formula 1 points. Formula 1 cars and drivers return to action September 25th for the Singapore Grand Prix.